This is a sponsored post written by me on behalf of Fresh From Florida for IZEA. All opinions are 100% mine. As the weeks roll on in this pregnancy, I can feel the urge to nest grow stronger and stronger. Unfortunately I don’t have as mush energy as I’d like to do all the things I want to do. There’s so many things I want to change in the house before the baby gets here, because I know I’ll have no time to do anything after the baby gets here. So I’ve been going through closets, cleaning them out. I’ve been going through old baby boy clothes and picking out what things I could possibly re-use. And I’ve been doing a ton of laundry and re-washing baby things that have been gathering dust over the years. Since I’ve been so busy cleaning and organizing the house, I haven’t been spending as much time in the kitchen, so I try to make meals as quick, healthy and nutritious as possible. Using fresh local ingredients makes this so easy, and since I live in Florida, there’s an abundance of fresh seasonal produce this time of year. Even though we’ve had our share of below average temperatures, the weather is still mild enough in the sunshine state to allow for wonderful fresh produce all through winter. Local produce is easy to find at our grocery stores, farmer’s markets and at restaurants, so it’s easy to buy and eat locally. Eating fresh, seasonal items means things are fresher and tastier, the nutritional value is optimized, which is important for me now since I’m pregnant! And the best part about eating local is that it’s cheap! To find the freshest foods, I just look for the Fresh From Florida logo to be sure that the produce I’m purchasing is local and fresh. You can not only find this logo in the price department, but in the seafood department and in your favorite local Florida restaurants as well. 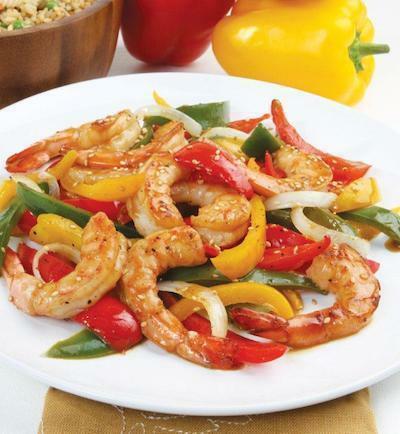 For this recipe I used fresh Florida bell peppers and freshly squeezed orange juice. I found Florida Bell Peppers at amazing prices today at the grocery store. I just couldn’t pass them up. 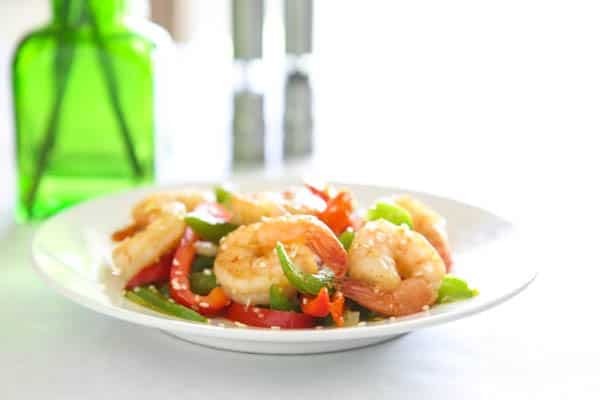 After I got home I found this great recipe for Florida Gulf Shrimp and Sweet Pepper Stir-Fry on the Fresh From Florida site. My whole family loved this recipe, and I loved how fast and easy it was. You can head over to the Fresh From Florida site and view some amazing recipes that utilize fresh seasonal Florida produce and seafood. Be sure to check back often because they update the site with seasonal recipes. Or, next time you are dining out or shopping for groceries, look for the Fresh From Florida logo to make sure that your food selections are fresh, healthy and support your local community. Be sure to connect with Fresh From Florida on Facebook and Fresh From Florida on Twitter too! Preheat a large sauté pan over medium-high heat. The photo below is curtesy of Fresh From Florida. That’s a whole lotta good stuff right there. Pass me a fork! So pretty. I love the light in these photos. What a fantastic way to use seasonal ingredients and prepare a quick, easy meal. My family would love this recipe! This looks so pretty and super delicious! Looks like a nice light meal! This looks so tasty and fresh. Love the vibrant colours. I swear I keep saying I want to move to Florida just for the produce. I live in Southern Ontario. It’s flipping cold here. I feel like I was born in the wrong place. I never experienced the nesting I hear so much about when I was pregnant. I wish I had because I would have been so much more relaxed once the baby came…..or not. Whatever, this stir-fry looks fabulous and I’m super jealous of your life in the sunshine state. It’s like 5 degrees here right now. That shrimp, though…. that looks so dang good!! I loved seeing your list of fresh January foods from Florida. Nothing beats fresh. Good luck with the remainder of your pregnancy. With foods, and recipes like this, I know you’re taking good care of yourself. Mmmm freshly squeezed orange juice is a weakness of mine! 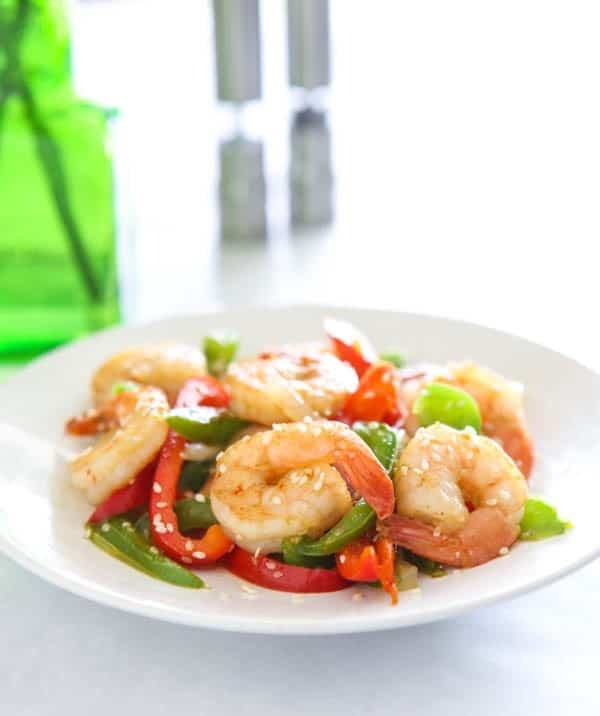 <3 Love anything with shrimp in it too! We certainly love to eat seasonally it is just natural and I always feel much better. Love this dish – everything I love is on it. I’m pretty sure I said the same thing this time last year but I’m SO jealous of your fresh produce right now! There’s only so much cauliflower, kale, and squash that a northern girl can eat… This stir fry look great. I don’t think I’ve ever has peppers with shrimp before! Having four boys, I always loved the trip down memory lane when it was time to wash the baby boy clothes and settle them back into drawers. Quick and fresh is the only way to cook while pregnant or with little ones. I’m a bit envious of all the lusciousness in season in Florida at the moment! I wish I lived in a climate where we could eat fresh all year long. Instead I live in a climate where if I went outside right now the cold air would make my face hurt…sigh. 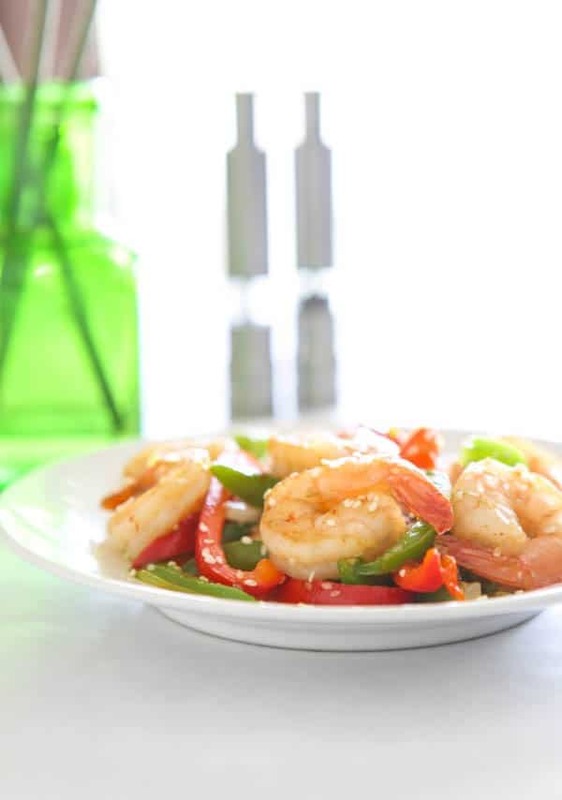 This dish looks great and really showcases all that fresh Florida flavor. Love the look of this big juicy shrimp. I love shrimp with everything, and your photos are gorgeous!